Hi friends and Happy Thursday ...... I think! but I can't for the of me remember what day it is! I ran around all day today thinking it was Tuesday! The CCEE Stampers this week have our final challenge with our hostess, Anne. 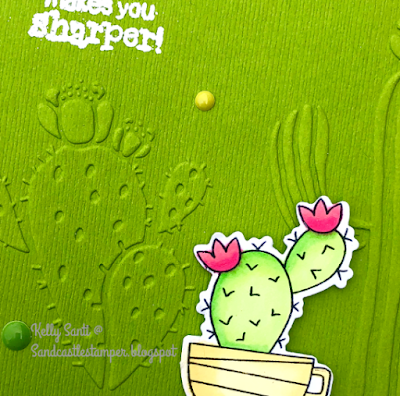 She asked us to create a card using embossing folders. I am so in love with succulents! and colored it with my Zig clean brush markers. Then, I heat embossed the funny coffee sentiment from the set. These are not big 'name brand' embossing folders but definitely do the trick! and the stamps are an added little bonus. but they are online right now for $1.oo. 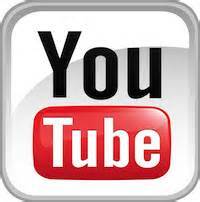 I bought 3 planning to do an review on my YouTube channel .. I'll enter this into the Spring/Summer Coffee Lover's Hop! the sweetest message via Facebook! all over the world in an Air Force family. She mentioned her son is a new US Marine and stationed in Hawaii ..
and I sent her a package to her and one for her to send to him. She received it as she sent the sweetest message via FB. previously, which you can see here. In case you were wondering why a mouse on a card for a soldier? 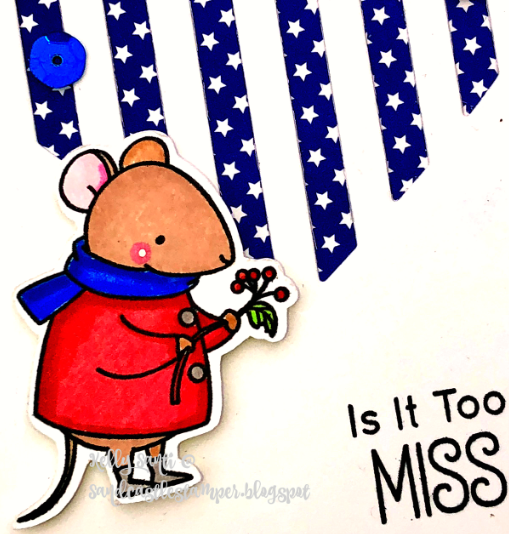 and Pansy - hostess for May - asked us to add a mouse to our cards. It's her signature since she's C-Mouse - isn't that cute! 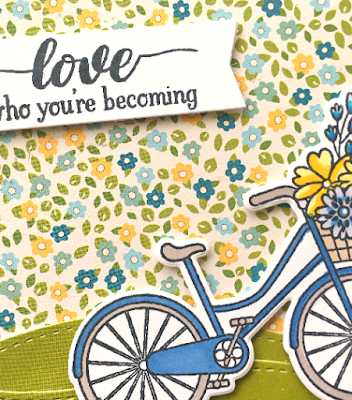 and then added a sentiment from another MFT stamp set "Adventure is calling." and the sequins were added to finish off the look. 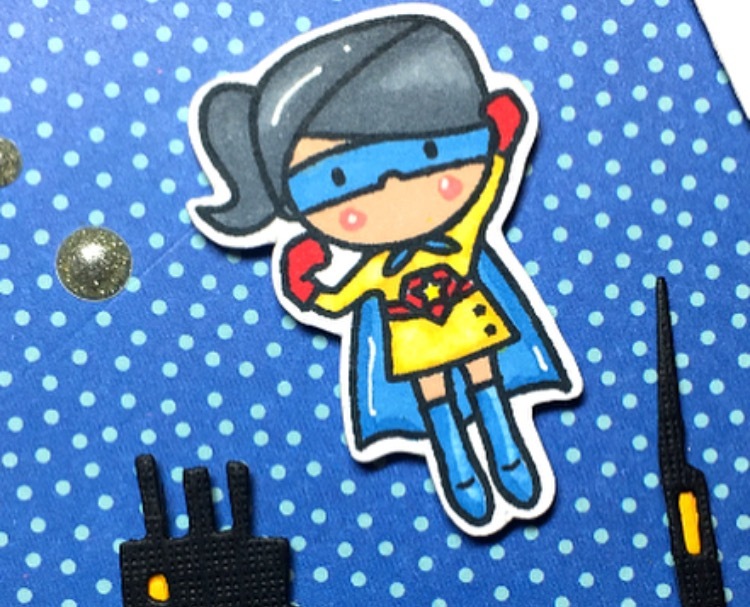 Sunday Funnies ~ 4th Edition: You're SUPER, girl! 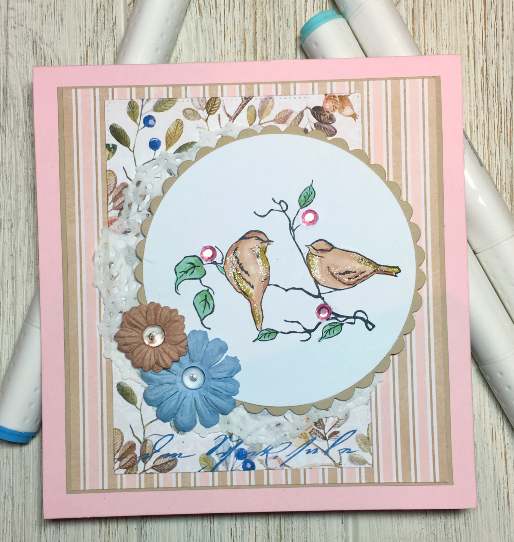 I so loved the soft, subtle colors from this week's MFT Card Challenge #94! I normally make a bee line and zero straight in on brights, bolds, vivids! This was such a refreshing change to color/create with a softer palette. These colors - so yummy! that I was super lucky to get during their $10 sale back in February. I've wanted this set since forever so I'm happy to know have both! then die-cutting both to make an elongated city in the background. 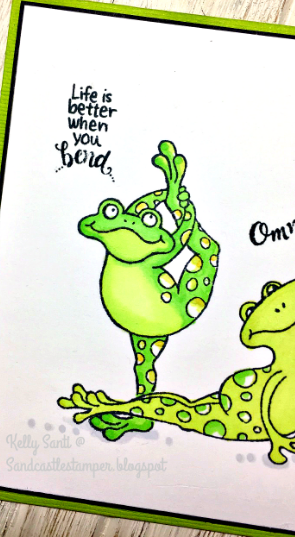 coloring both in the colors of challenge #94. Thank you all for your visits, especially during the Sunday Funnies series! I'll enter my card into the current @mft challenge. and Anne has a new challenge for us. I wake up in the morning to the NEWS. 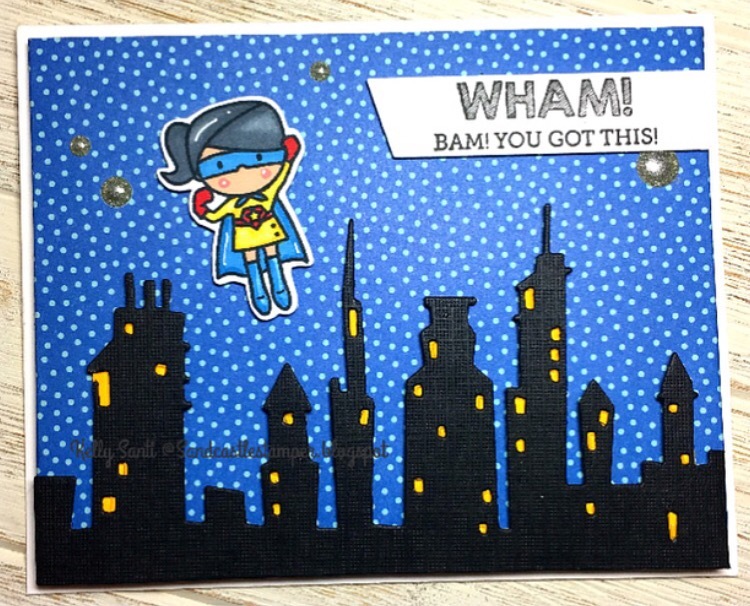 Make a card using each of these letters ..... N, E, W, S.
but creation a cityscpape with the Tim Holtz dies. I ran it through the cuttlebug twice, once in black and once in yellow. After popping out the small squares for windows, I let the yellow shine through like light. and added some glittery silver enamel dots. you can read about it in the first series post here! made with this theme ~ it will be fantastic! 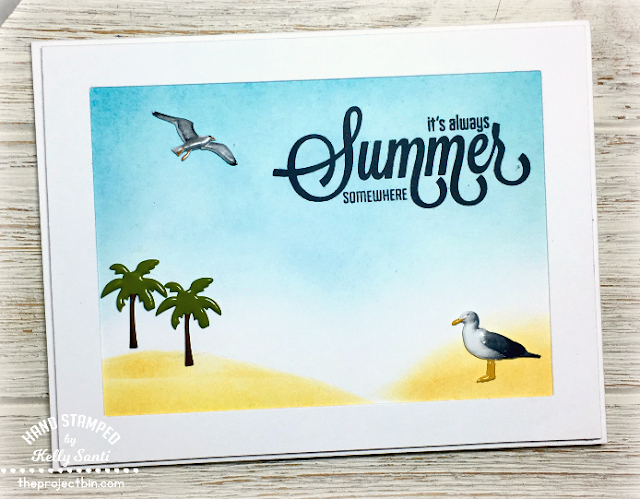 TPB ~ It's Summer somewhere! 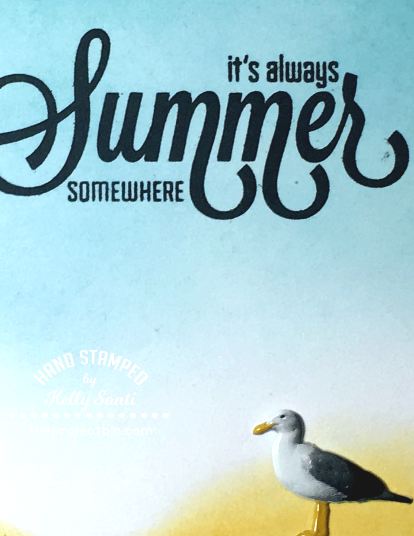 Today's card is channeling summer! This card was such fun to make. 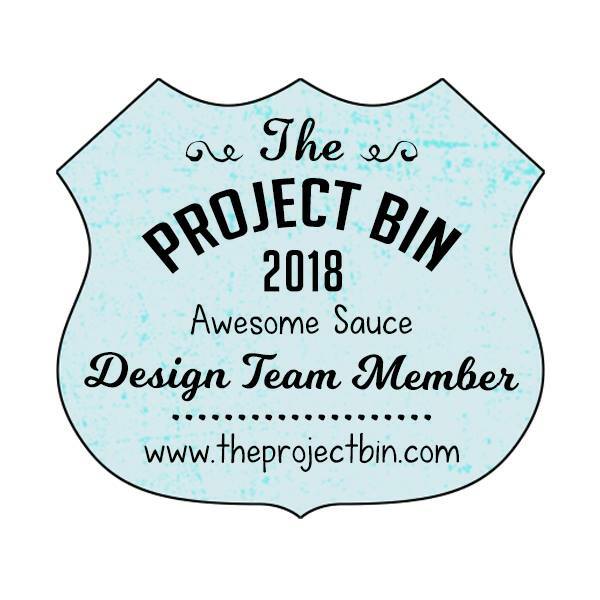 and The Project Bin from the Instagram hop they had this weekend. 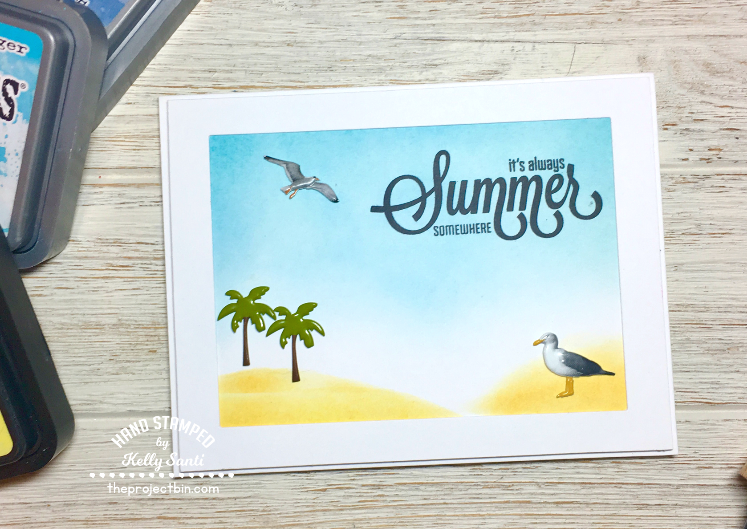 I used the Summer Fun stamp set, one of my favorites! since I knew that's what my card would be. in Broken China and Squeezed Lemonade and my mini blending tool. and in order to do that, I created a template out of chipboard. the quintessential bird at the ocean! popped the whole card onto 3D foam. This card is really thick, measuring almost 1/4 of an inch! 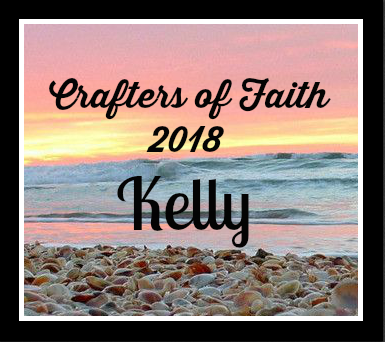 Sunday Funnies ~ 3rd Edition! 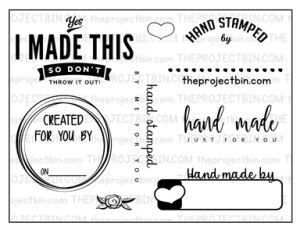 I have so many ideas for this stamp set! I fussy cut the images. The die cuts are from the massive Hobby Lobby clearance hall ~ $1.25! 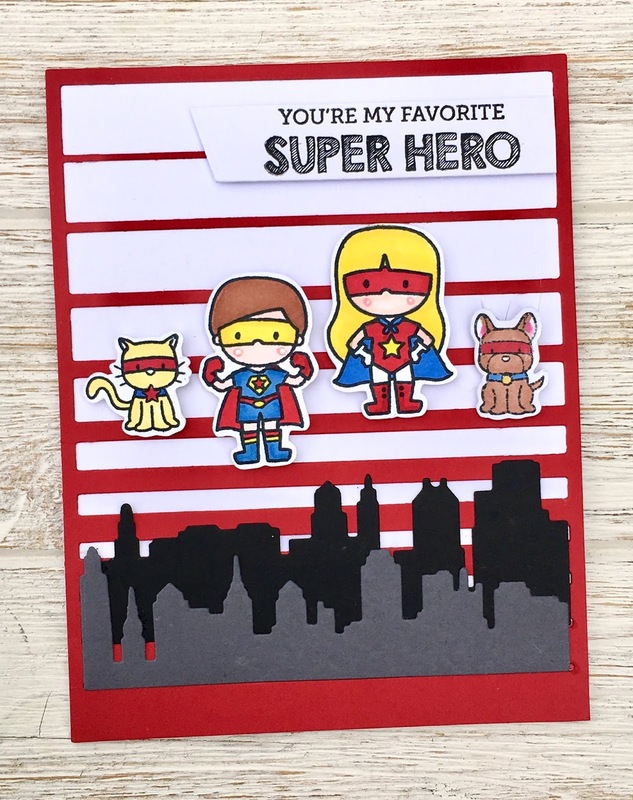 It was a 3 pack of Momenta cityscape dies and a really wonderful find! It was a perfect match for the scene building ..
and a lighter grey for the forefront. I didn't want you to miss out on an extra chance to win! 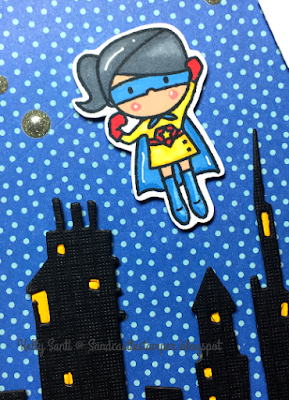 and one for the CCEE Stampers challenge! a card/project using 'hoarded paper' ~ perfect! It's a bit more challenging and thinking (way!) outside the box! of the old saying "Something old, Something new"
Here is your challenge: It is based on my daughter's recent wedding--"Something Old, Something New, Something Borrowed, Something Blue, and A Sixpence in your Shoe!" With the season of weddings upon us, I thought this traditional wedding saying would be a fitting challenge to create a card or project! This tradition comes from an Old English rhyme and the four objects that the bride adds to her wedding outfit or carries with her on the big day are just good luck charms. Of course, it is a folk tradition in that, for example, something old represents continuity; something new offers optimism for the future; something borrowed symbolizes borrowed happiness; something blue stands for purity, love, and fidelity; and a sixpence in your shoe is a wish for good fortune and prosperity, although this remains largely a British custom. So this is where your card or project come in! 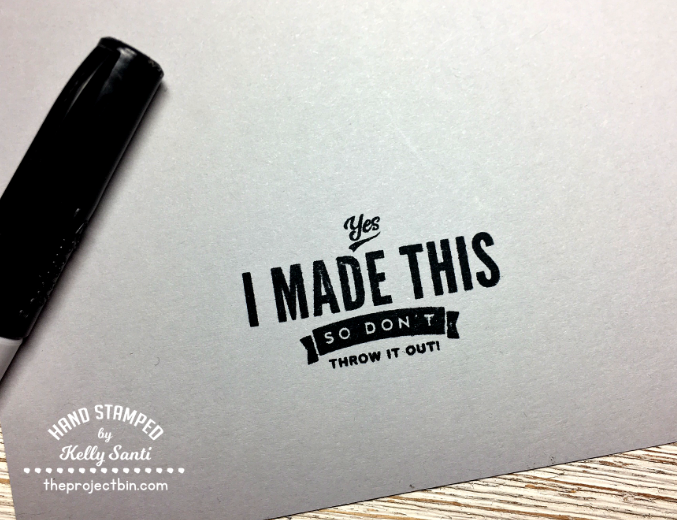 You may use this saying in any form you like BUT use at least 2 ways to transform this saying into a card. 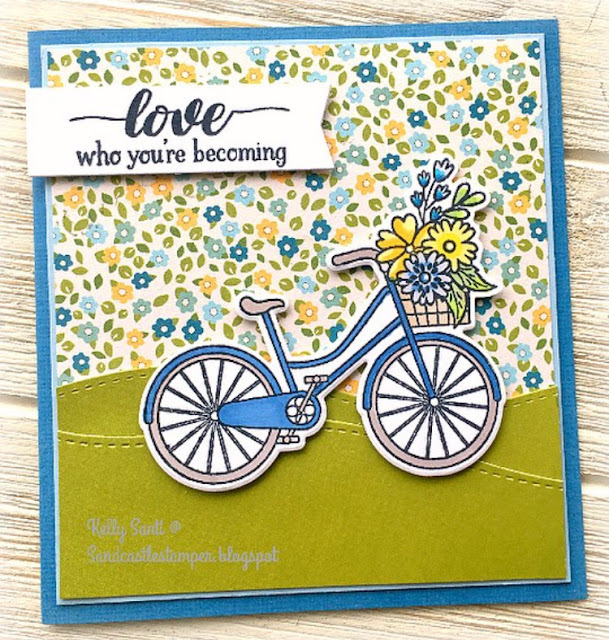 For example, your card could use a borrowed stamp, one that's old or new ... you can make it in shades of blue .... you get the idea. It does NOT need to be a wedding card ~ just as long as we see where the (minimum) of 2 things you chose are! Ready? Set. Go! 1. Something Old ~ this paper! Gosh, it's been in my stash, hoarded indeed. I even bought a second pad because I loved it and didn't want to use the first one! And, for Anne's challenge, ✓! 3. Something Borrowed ~ This is skirting a little bit, lol, but I borrowed the idea of a bike ride from my friend Barb ~ she does love her bike rides, including long bike tours for miles and miles! Impressive! 4. Something Blue ~ I purposely chose the paper for Anne's challenge to have hues of blue so I could use blue cardstock. And I colored the bike blue :) My bike in real life is green and her name is Jo-Jo! No six pence in my shoe - but I"ll be thinking good thoughts with all the royal wedding watchers! I'm SO excited to see Meghan's wedding dress most of all! My mum is from London, born and raised, so we're all super thrilled to see this wonderful event. be sure to click their blog links. 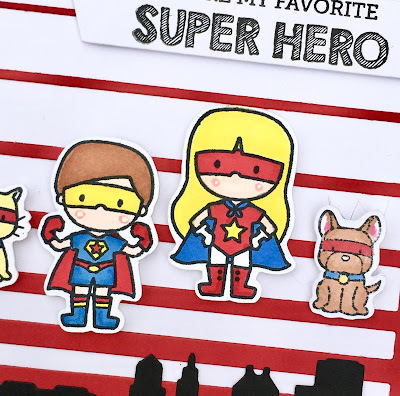 Next month, it's Barb's turn and she already has an amazing theme picked out! 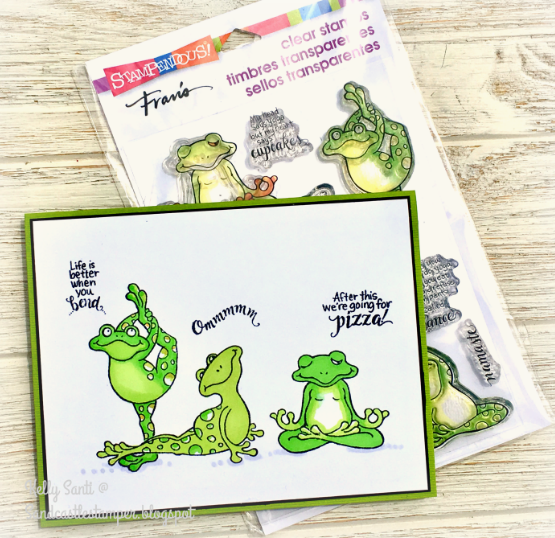 And, of course, the CCEE Stampers blog is here! Today is World Meditation Day! I try to keep up on my obscure holidays because I think they are hilarious! 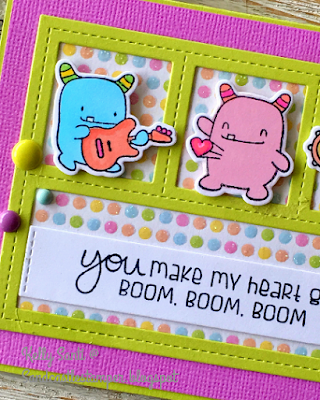 They are also a great way to springboard an idea for a card! from Stampendous and set them aside. Today, I went through my stamps looking for them - it was perfect! as I didn't have time to brace for impact. PTL, nothing is broken - just bumps and bruises and a concussion. We are a group of friends divided into two groups: The Divas and the Dazzlers. come up with a theme, mail card kits to all the players, and we make a card! and Heather sent us this month's kit. The theme they chose: A Spring Tweet! This was such a pretty kit .... It's very feminine and ethereal. 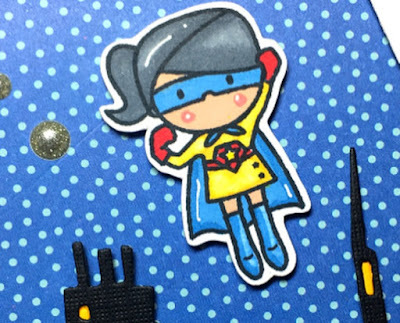 Thank you, Heather and Paola, for a sweet tweet this month! TPB ~ You roll with style! 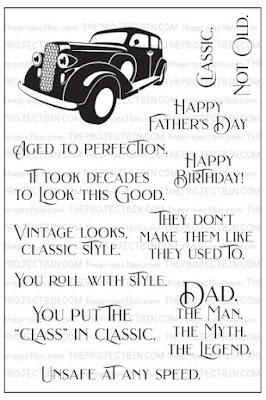 Now that we've celebrated the moms, next up is Father's Day! 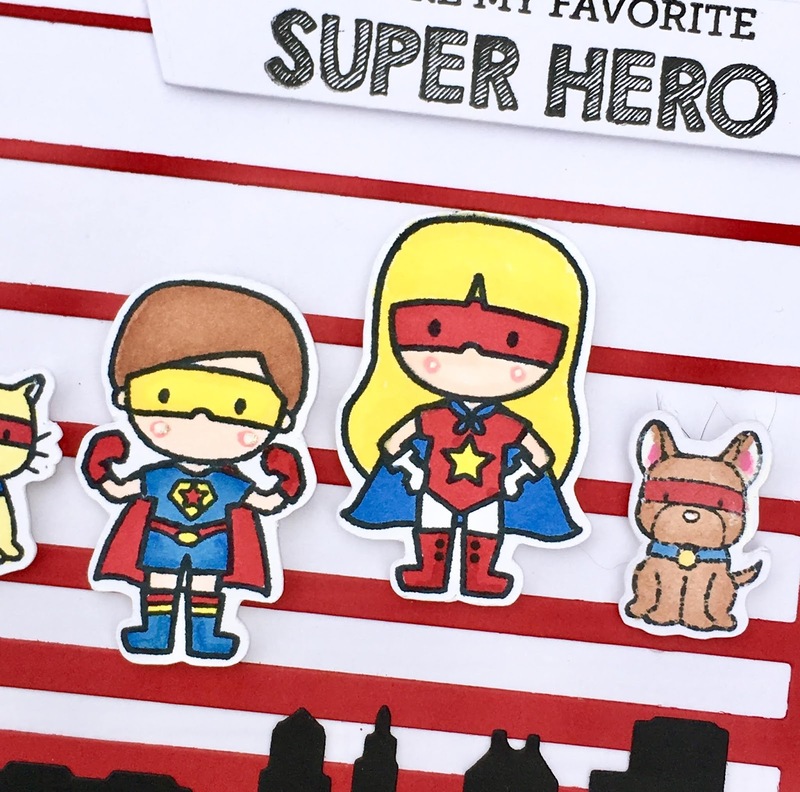 to get a head start on those masculine cards ..
especially with this super fantastic 'Classic Man' set. 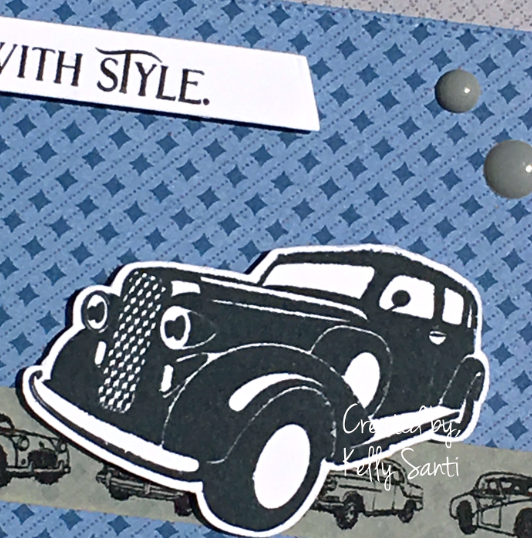 antique car washi tape from the Eyelet Outlet! And woohoo - it's 50% off in their store! 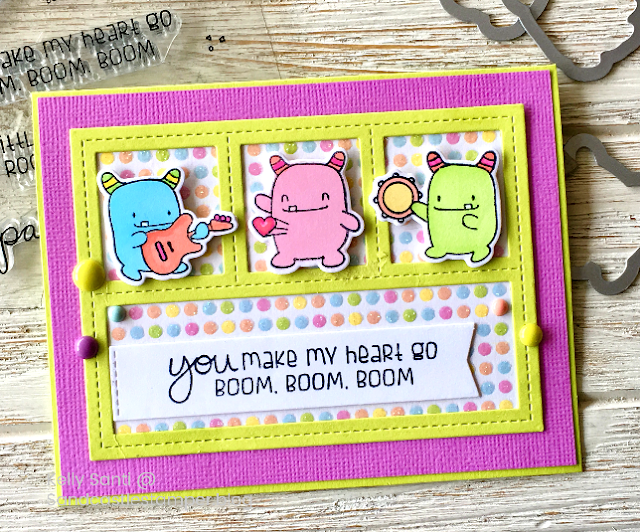 I started with a simple A2 base and created a frame out of designer paper. 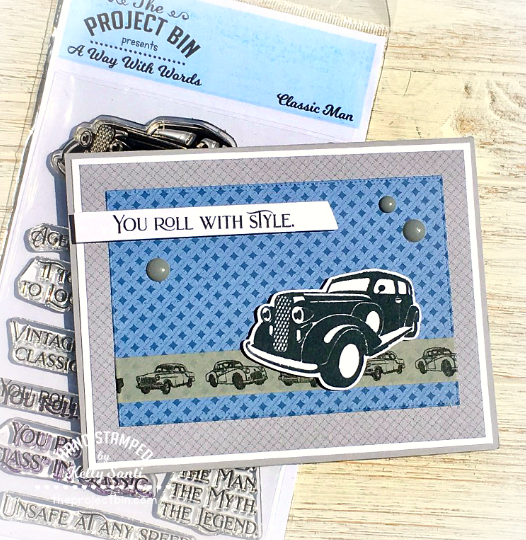 I stamped/fussy cut the classic car and added it as a focal point. 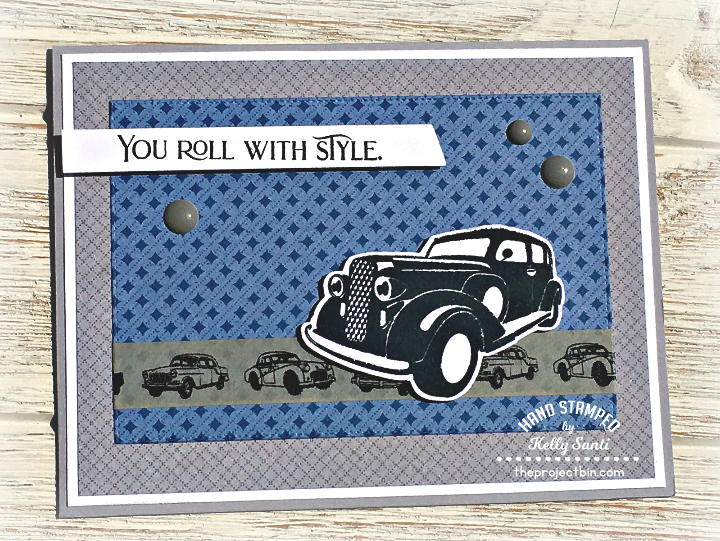 Finally, one of the sentiments in the set "you roll with style"
seemed best fitting so I chose that, some enamel dots and done! I always tell him "Don't throw this out ~ I'll be famous one day!" I'll enter this card into: A gem of a challenge - Masculine! 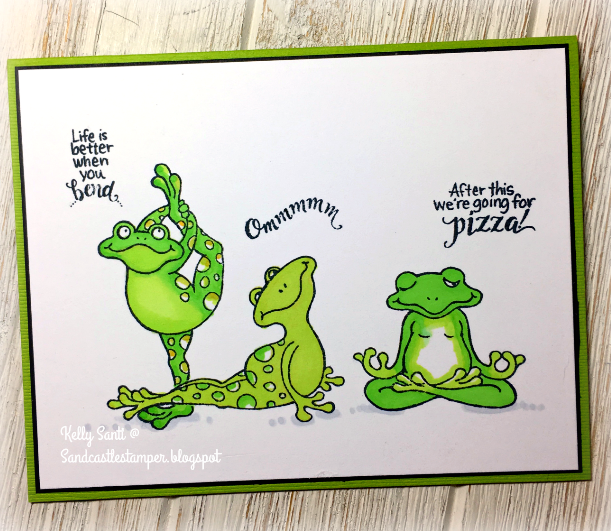 Sunday Funnies - second edition! for the Sunday Comics - second edition. you can start on Week 1 here! what got me when I saw it! giveaway at the end of the month! what is your favorite color combination when crafting? CCEE ~ Red for Anne! Holy Guacmole! It's Taco Tuesday!